Here at Creve Coeur Paving, your pavement is our passion. We have been serving the St. Louis metropolitan area and surrounding counties since 1973. Creve Coeur Paving provides high quality, cost effective solutions to your asphalt problems. If you have asphalt, or an asphalt related problem, we have a service or solution for you. We understand and implement specific strategies to preserve your property and your bottom line. Whether you’re looking for long term or short term results, we deliver the maximum return on investment you’re looking for. You can rely on us to develop sound, practical solutions for whatever your need may be. We offer in house, all aspects of asphalt services and preventative maintenance. From filling potholes, sealcoating, patching, overlays, resurfacing roads, paving driveways, parking lots, curbing, drainage systems, and even line striping; our decades of experience has you covered. Creve Coeur Paving can put in new curbs, add on to existing, or replace broken curbs. With a large selection of molds we can help you with all your curbing needs. Watch our curb machine in action in a full 360 degree video! 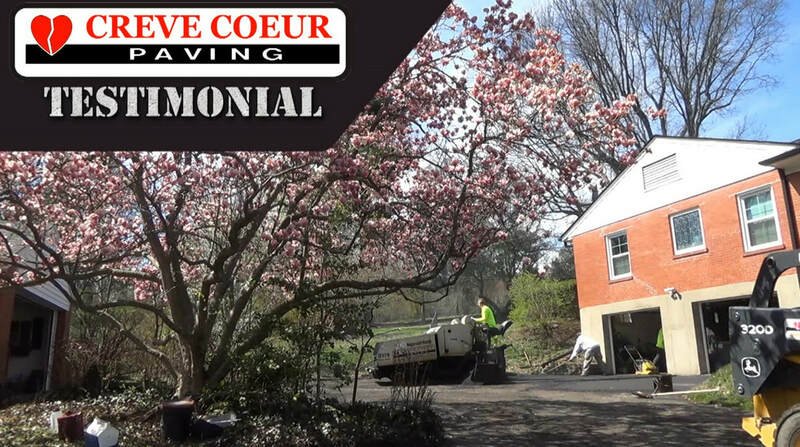 Hear straight from our satisfied customers on why Creve Coeur Paving was the right choice for them! Check out our new Seal Coat machine in action. Equipped with a jet engine for easy cleaning and state of the art controls to give your asphalt the protection it needs, the Neal DA 350 is a force to be reckoned with! Once you asphalt project is in place you will need to know what to do to keep your asphalt maintained to ensure a long life for your asphalt surface. Need to know how often to seal coat? What causes driveways to crack? ​Let us help you with our frequently asked questions!